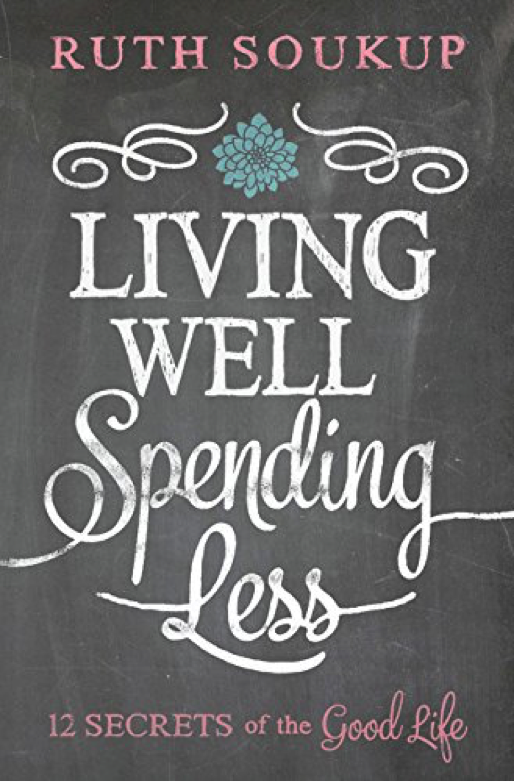 Living Well, Spending Less was written to bring hope and encouragement to every woman who currently feels overwhelmed or stressed with a life–and budget–that feels out of control. It speaks to the mom trying to juggle all the demands of a busy life with the pressure to keep up with those around her. It is a practical guide for those of us who often long to pull ourselves together but don’t always know how. It is real, honest, packed with practical tips, and speaks to the heart of the matter–how can we live the life we’ve always wanted? Author talked about how she loved money and possessions since she was a kid, and how this way of thinking nearly destroyed her marriage in the future. Also, the author wrote about how she was able to give the word Good Life its new definition through her prayers. Through trials she recognized that the real Good Life has nothing to do with possessions or money. Instead, to her, “a good life is a life rich in faith, family, friends and creativity”(33). From her daughter, who’s just like herself, the author realized that she is incapable of simply enjoying the moment, of appreciating what she has instead of worrying about what she is missing out on. She wrote that, in order to change, she had to realize the priority to her life. Recognizing what’s most important to her life, cultivating an attitude of gratitude, eliminating temptations, she finally realized that contentment is a choice; choosing to stay away from the things that make us stumble. Author used her friend Alysha who continued to pursue her goal no matter the hardship she had encountered to illustrate what sweet spot is and what we should do with it. Sweet spot is where a person’s passion meets his greatest strength (53). The author also wrote about how she had been wandering in the wrong path due to her parents’ expectation, but when she realized that it is okay to fail although it could be hard, she was able to quit the wrong path and finally find her own sweet spot. The author wrote about how after her husbanded stopped going out to work she found that she lacked a clear direction and focus causing her to waste far too much time on the things that didn’t matter, and not finding any time for the things that did. She solved it by writing down her vision with specific plans that she had to accomplish by specific due dates. Also she wrote about how writing down goals changed her way of living as well as her marriage. At the end, she emphasized again about how written goals can change one’s life. This chapter talked more about making good habits with the time we have. How they struggled everyday for months to establish a new routine and new pattern. How their life basically became a Grind day in and day out. Quoting the saying from the beginning, “Time is what we all want most but use worst”. Talked about how throwing away stuff can be hard because it seems so wasteful. And how the main problem was how combination of their differing personalities turned the home into a black hole. This chapter also displayed ways and tips on how to get rid of stuff without losing everything and while keeping all your deep possessions. Explained how she got a thrill from every item that fell into his cart. And how she planned out his purchase methods and ways to hide evidence of her crazy spending from the family. How there are two types of people those born to shop and those born to save. This passage talks about how she spent just because she could, because it was easy and it was all she knew. How she was drowning in credit card bills while planning to plan a new way to stretch out her budget and save more to make wise financial decisions. Shop the Sales– This is usually more effective than couponing simply because it allows more opportunity for savings throughout the store. Coupons usually only focus on a few items. Stockpile– Stockpiling food that you buy on sale can be an effective way to save money. Buying more at one time for a lower price saves over the long run so long as you can guarantee you will use it. Save on Meat and Vegetables– In General, meat is the most expensive item to shop for. You can save by simply eating less meat. However, you can also save by making the product go farther with bread crumbs, buying in bulk, and looking for sales or discounts. You can do similar things with vegetables. One extra advantage is to grow your own garden to save on money. Why I Make My Bed Every Day– The author views keeping a tidy home as essential and a comforting part of her daily routine. It often encourages people over and allows her to get more work done. It can also become a source of pride from which to draw from. A Cleaning Routine that Works- Finding a cleaning routine that allows you to keep your house tidy is essential. It must be something that you can do every single day; no skipping. Green and Thrifty Homemade Cleaners– Homemade products can be much more cost effective, smell better, and are more eco-friendly than store bought. Recipes can routinely be found on the internet for a wide range of products. Nurture your Friendships– Nurturing the friendships that you already have will cultivate a stronger relationship with everyone involved. Relationships will be more meaningful. Cultivating new relationships help to broaden yourself to new ideas and concepts, while giving more opportunities to be generous with your gifts. Practice Hospitality– Make your friends feel at home. Don’t be afraid to reach out and be the first one to be generous. It will open them up a little too. Cultivate Creativity- Provide more opportunity for you to be more creative, especially if it involves being creative with others! Less Greed– Don’t be stingy with money, but also do not hold back on your time, talents, or gifts. Greed can be easy to spot in others, but sometimes not in ourselves. Giving of our Time and Talents– Give of your natural born gifts every day. There are opportunities for everyone. You can also get a lot of satisfaction from volunteering where you have gifts, such as carpentry and letter writing. Giving of our Hearts– Be gentle, and willing to give of your heart. Do not be stingy or untrustworthy of giving of your heart.